Genuine walnut plaque with metal casting, including black brass steel engraving and 2 1/2" medallion. Individually boxed. 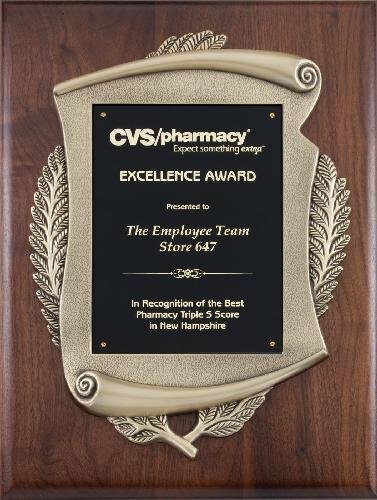 Our collection of cast relief plaques boast intricate scroll work and wreath designs, a perfect award presentation fo sales awards, achievement awards, employee awards and other corporate award events. Genuine walnut plaque with metal casting and black engraving plate. Individually boxed. Genuine shield plaque with metal casting and black engraving plate. Individually boxed. Walnut Clock Mounts and Plaque great for use in corporate award presentations. For use with VCM-3 quartz clock from The CAT. Genuine American Walnut plaque with Black brass engraving plate and Florentine border. Individually boxed. Genuine Walnut plaque with black textured edge engraving plate. Individually boxed. Genuine Walnut Plaque with blue marble plate with gold border. Individually boxed. Genuine American Walnut plaque with black engraving plate with gold border. Individually boxed.